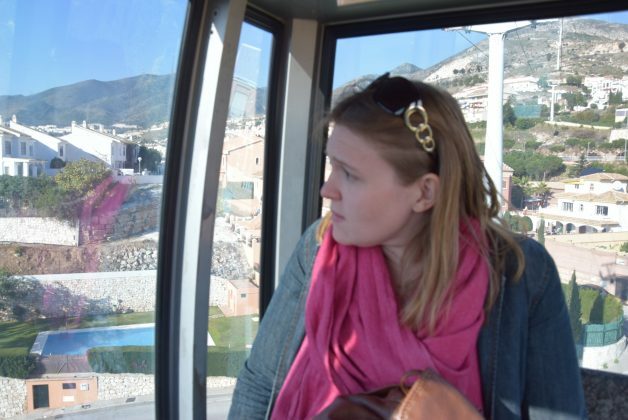 The Telecabina takes you on a fantastic 15min journey in a four-person cable car ride up to the highest point on the Málaga coast. 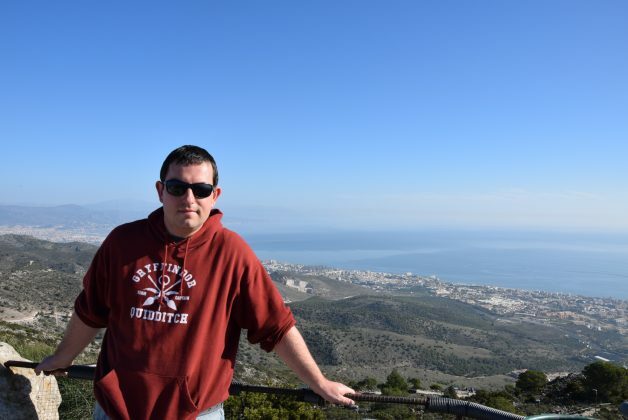 From this superb vantage point, you not only have the most magnificent views of the Costa del Sol but also the excellent panoramic views of Sierra Nevada mountains and the Guadalhorce Valley and on a clear day, you can see Gibraltar and the coast of Africa. There is lots of parking at the bottom, and we made our way to the entrance, we didn’t need to buy tickets at the kiosk as we had purchased tickets online at a discount. So we hopped on, and the look on my face says it all, I’m not a lover of heights, and it felt a little too bumpy for my liking, lee’s picture of me says it all. But I soon settled down and started to enjoy the view, the cable car never really came off the ground that far and it wasn’t that high. The cable car itself has a talking guide you can put on, and it tells you a little bit about the local history and the views you can see while travelling up and down. We got to the top and just took a moment to soak in the view; it was one of those moments you just sit and ponder for a second and just look at the breathtaking view. We continued to travel further up the hill and chose one of the paths that take you to the very top of the mountain. This path, wow, it was steep and the steps were a hard job for me to climb. Those who aren’t as able-bodied would definitely find this very difficult and unfortunately it’s inaccessible for those in an wheelchair. Eventually, we had it to the top but it took us some time I tell you but the 360’ view spreading as far as the eye can see was amazing, I sat down not only just to catch my breath but just to soak everything up, it was terrific. It just hit home to me just how small we are in the grand scheme of things, we really do just borrow this land we live on. It is clear the earth around us will be here long after we have gone. After our adventure getting to the top it was time to come down, we chose a different path but to be honest it was just as difficult to navigate the huge boulders which were supposedly steps. Phew! Towards the end of the path down we came across a series of cages, we sore one of the keepers holding a falcon and we carried on down to investigate further. 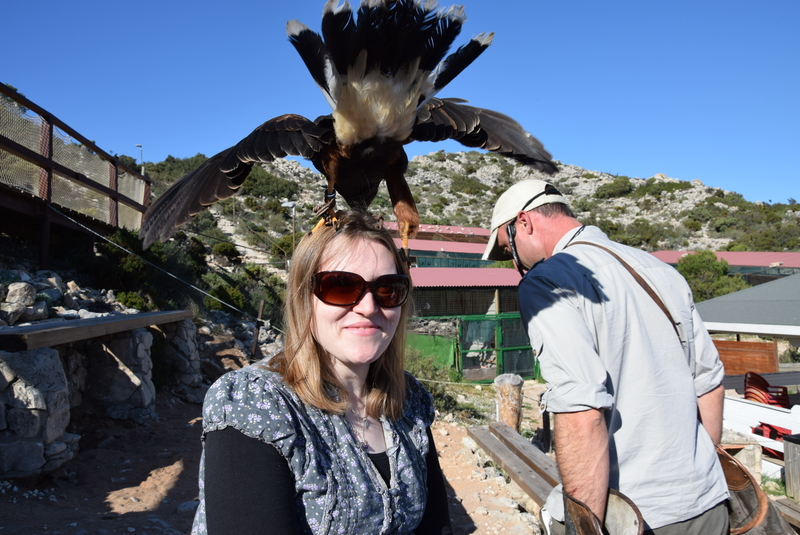 Oh and I’m so glad we did, it was a scheduled falconry show, and it was completely free because we had bought the cable car tickets to get up the mountain. Yay! As we walked along the path towards the arena, there were owls and falcons on their perches just off the beaten path, posing just as you take pictures of them. We sat down, and the main keeper spoke to the crowd in both Spanish and English, which was great as we got to know what was going on during the show. The show started with American vultures, I’d never seen vultures in my life before, I was in complete ore, and I may have even gasped a few times as they flew over our heads. Then they showed us various falcons, the interaction with the crowd was astonishing, the birds were landing on our heads and arms throughout the entire show, even me and Lee got our share of love as you can see by the pictures. The show was great and not one we had experienced before. Just before we headed back down the mountain, we took a look at the cost of refreshments and blimey it was expensive, so don’t forget to make stuff to take with you. The ride down for me was better, I kinda knew what to expect really, so I was more relaxed. 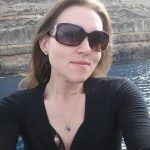 It was a lovely day out and one I recommend you do, just be aware that it’s tough on the legs and take food and drinks with you.